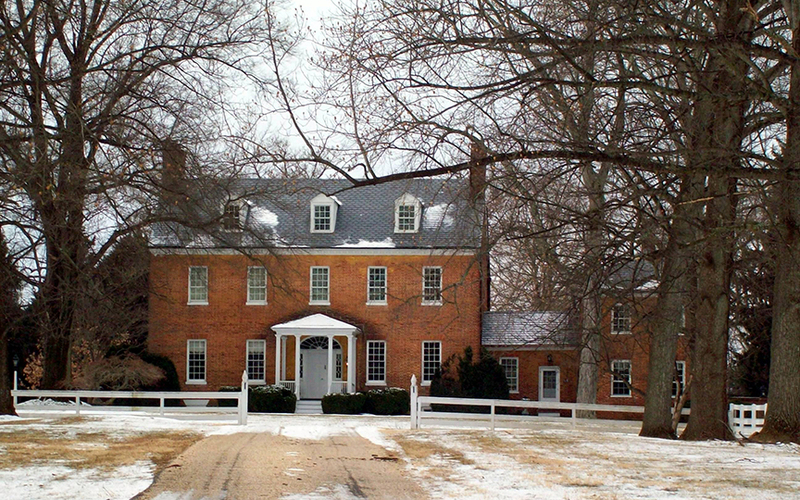 Burleigh Manor, 3950 White Rose Way, Ellicott City, listed on the National Register of Historic Places in 1982. Photographer: User: Pubdog, 2012, Wikimedia Commons. Howard County Government offices are located at 3430 Courthouse Drive, Ellicott City MD 21043; phone: 410-313-3000. Howard County, organized in 1851, bears the name of John Eager Howard [1752-1827], one of the most illustrious soldiers of the Revolution, and afterward governor of Maryland and Unites States senator. It is triangular in shape lying between Baltimore, Carroll, Frederick, Montgomery, Prince George's and Anne Arundel counties, in the heart of the Western Shore. The Patapsco River forms its northern border, and two small branches of the Patuxent River extend into Howard from the Anne Arundel line. Another branch of the same river separates it from Montgomery. The main stem of the Baltimore & Ohio Railroad, the section of which from Baltimore to Ellicott's Mills was the first passenger railroad in this country, runs along Howard's northern border, and the Washington Branch of the same road along its southern border. The cornerstone of the Baltimore and Ohio was laid July 4, 1828, by Charles Carroll, then upwards of ninety years old, and he said of this act that he considered it second only to his signing the Declaration, if "even it be second to that." The area of the county is 250 square miles, and its topography is hilly and broken, with heavy forests and fertile hillsides and valleys, the arable land being especially adapted to wheat, corn and hay. As early as 1800 the iron ore deposits of Howard County led to the building of the Avalon Iron Works, and Howard ore is now the only Maryland product of the kind being smelted. In granite, marble and building stones, Howard is especially rich. Guilford and Woodstock granites are known throughout the United States. Ellicott City, the county seat, on the Patapsco River 15 miles from Baltimore, is joined to the latter by an electric road. Ellicott's Mills, as it was known from 1774 until the latter years of the past century, is noted in Maryland history. The manufacture of flour was begun here by the Ellicotts in that year, and this industry is an important one in this section of the State. The town has a population of 1,331. Rock Hill College, a widely known educational institution, is located here. Woodstock and St. Charles Colleges and the Ilchester Redemptionist institution have made the county known wherever the Roman Catholic faith is preached. At Alberton and Savage are large cotton mills, operated by water power. Howard County has been the birthplace or the home of many Marylanders noted in political life, on the bench and in the arts and sciences, and on her territory was first heard in Maryland the demand for separation from the mother country.